Three bedroom villa for sale in Benissa Coast. 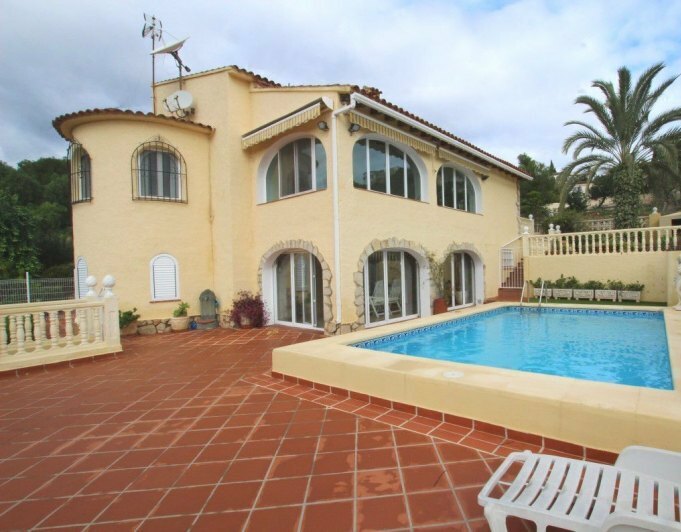 A delightful three bedroom villa for sale on the Benissa Coast. This is a lovely ten year old three bedroomed villa. As you enter into the driveway via automatic gates you find ample parking for 34 cars. Leading down to the principal villa level we find a spacious terrace and covered Naya/Terrace which gives way to a large bright lounge and dining room and a large open plan kitchen which is fully fitted and has a separate access out to the garden area. To the opposite end of the lounge are the bedrooms and bathrooms. Bedroom one and two are fully fitted with builtin wardrobes, airconditioning, ceiling fan. These bedrooms share a guest shower room. Finally we have a large Master suite with a large bathroom and walkin shower. Builtin wardrobes, airconditioning, Roller shutters, Mosquito nets. This bedroom also benefits from sliding patio doors that lead out to the terrace area. The garden is a well maintained and very private peaceful area with a large 10m x 5m swimming pool. There is also a separate shower room and wc adjacent to the pump house. Benefits Constructed ten years ago by Villasbuigues.The use of Tosca stone archways.Oil central heating.Mosquito nets.Double glazing.Ceiling fans.10m X 5m Pool.Private peaceful location.Fully Furnished.Airconditioning.